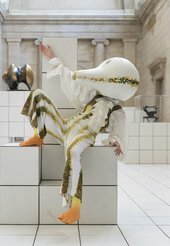 A solo performer in a squash-like costume inhabits the Duveen Galleries every day for more than six months for the Tate Britain Commission 2018. Each element of The Squash has evolved from Hamilton's interest in a photograph she found in a book several years ago when looking at improvisational theatre and participatory art practices in the 1960s and 1970s. It showed a person dressed as what looks like a vegetable lying among vines. The original photograph dated from 1960 and depicted a scene from a dance by American choreographer Erick Hawkins. Hawkins was interested in Native American philosophies and he took the form of this costume from the Squash Kachina of the Hopi culture. As Hamilton had lost the original source of this image, she was not able to discover its origins and was left to imagine its context from the image alone. The artist has brought together tiles, structures, sculptures and costume, inviting a performer to explore their own interpretation of the image and how it might feel to imagine life as other, as vegetable. The performer selects their outfit for the day from a collection of seven elaborate costumes. Each one is inspired by the original image and by different kinds of squash or pumpkin. The length of the galleries’ terrazzo floor has been tiled in domestic-scale white tiles to create a new environment within Tate Britain’s neoclassical architecture. 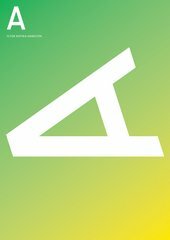 Anthea Hamilton works across sculpture, installation and performance. She is interested in the complexity of ways we read and respond to images. Hamilton was born in 1978 in London where she lives and works. The performer is in the gallery from 10am to 6pm every day but in that time they choose when they take their breaks, meaning they might not always be present in the space. Hamilton’s creation is a shot of tequila in the white wine spritzer world of Tate: it’s massively fun and makes you want to touch everything, love everything. Hamilton crashes through the stuffy barriers of art-with-a-capital-A. When you step over the threshold, there’s an uncanny sense that you’re in a different world. The British artist introduces her exhibition Lichen! Libido! (London!) Chastity!